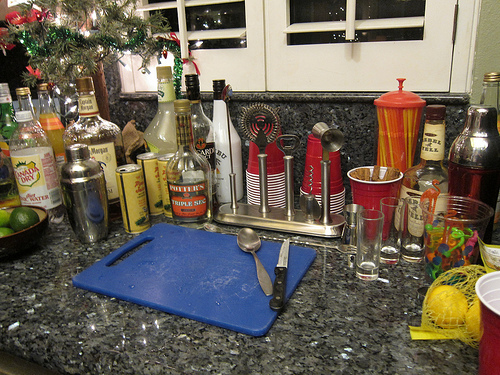 Although I rather be on a barstool than mixing and shaking drinks, I am the unofficial bartender at parties. It started in college and for all intents of purposes, I’ve been “bartending” for years. Sure, I’m best known for my Christmas Sangria which I only make once a year but I do make my “funny cocktails” which I don’t think anyone appreciates for the craft– just how quickly they can get drunk. My tip for you home bartenders? Double the booze. But balance!? Oh, my soul hurts. Okay, so while I got everyone sauced on Christmas Sangria***, I was quietly trying to “improve” this Wild Turkey American Honey whiskey. Besides my personal bottle of bourbon I stashed at this party, it was the lone bottle of whiskey (I had already taken my 2 bottles of Scotch away) in the house. I counted at least 10 bottles of vodka (including marshmallow vodka- we WILL get to that) and 1 bottle of gin. There was also some awful flavored rum (I am not talking about the Malibu– we’ll get there) and really bad tequila. Hell, there was also a bottle of Skinny Margaritas (my soul is now shattered). So, I must confess, I do not measure when I make drinks at home. I definitely don’t when making drinks for friends. I got at least 4 or 5 people asking for more sangria while trying to avoid being burned by the hot stove. There are probably two or three other people in the kitchen with me. I just go with the flow. Now, I will tell you that even though this American Honey whiskey is really sweet, everyone wanted their drink sweeter. These vodka drinkers all thought I was making cocktails with tequila (???) when they first had sips. Otherwise, I’d probably go with 3/4 oz of simple syrup. So, while I thought the jug of pre-mixed Skinny Margaritas was the most horrible thing ever (or was it the Malibu? ), it was actually the bottle of Smirnoff Marshmallow flavored vodka someone brought along with a bag of mini marshmallows. 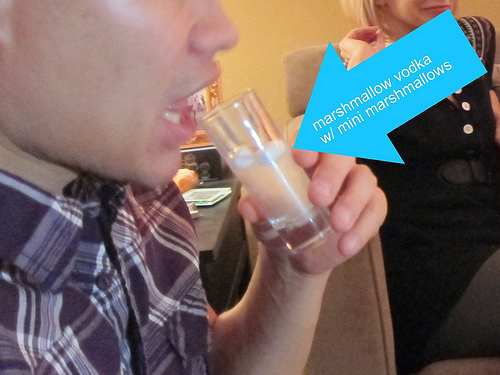 I stepped away from my little makeshift bar and watched incredulously as they did shots of this vile smelling, artificially flavored stuff WARM with three or four mini marshmallows floating in the shot glass. GAG. 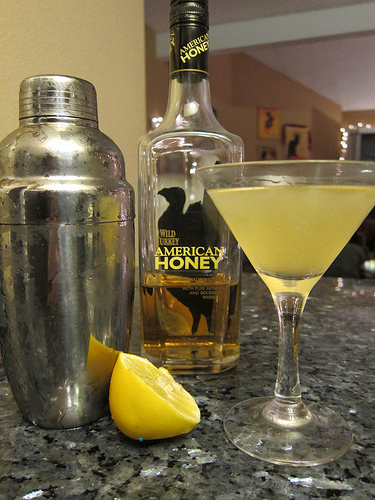 And when I ran out of American Honey, I switched over to Rebel Yell bourbon and instead of lemon juice, I used lime. I don’t have a name for it but I suppose it’s a variation of a variation. A friend did tell me the drink reminded him of the Eastern Prospector (orange spiced tea infused bourbon, honey, lemon) at Craft & Commerce in San Diego. Of course, that is a Gold Rush variation. I am pleased. Then I took away the simple and added a bit of pineapple juice. Ah, maybe this is what I find fun about drinks making- the endless variations. *** I did do a variation of the Christmas sangria this year. Instead of the citron vodka I used to use, I now go with dark rum and fresh key lime juice. This entry was posted in about, alcohol tasting, bar stories, events, history, la, la cocktails, los angeles, spirits, the minty and tagged christmas sangria, cocktails, cocktails at home, drink recipe, drink variation, gold rush, home bar, mixing at home, mixology by minty, variation. Bookmark the permalink.